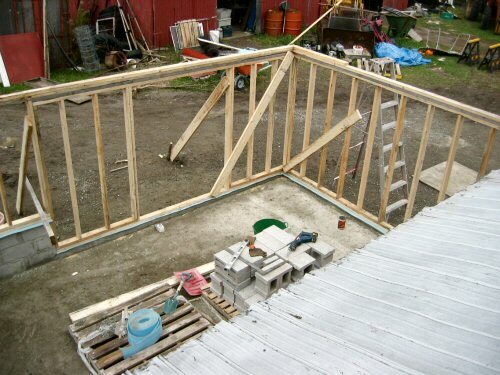 With the foundation in place, wood framing is surprisingly quick. In a few hours, the walls are framed up, and it’s on to the roof… Rough carpentry is interesting, you’re working not from a blueprint or even a real sketch, instead, there’s only an ongoing materials list assembled from plans in your head. Well, not my head. This is all quite new to me. Things go a little awry or something unexpected comes up, and it’s fixed on the way. So long as the basic plan is workable, you can always bang your way through the details.